Madrid to ban Vinicius from Brazil U20s in Jan. The South American Under-20 Championships come to a conclusion in Chile this Sunday with a match between Brazil and Argentina -- a clash in which the old rivals find themselves in very different positions. Argentina are the only country to have claimed one of the continent's four places in this year's Under-20 World Cup, taking place in Poland this May. A win guarantees them the continental title. A draw may well be enough. Brazil, on the other hand, must win to have any chance of making it to Poland. Their team have fought a desperately disappointing campaign, scoring just five goals in eight matches and never at any stage looking remotely convincing. Now they must raise their game at the last against probably the best team in the competition. And even a win against Argentina may not be enough. Brazil need results to go their way in all three of the day's matches. First, they are cheering for Uruguay to beat Colombia. If Colombia win, Brazil are eliminated. If Colombia draw, then Brazil will need to beat Argentina by a three goal margin -- unless Venezuela beat Ecuador in the second game of the day, in which case nothing Brazil do will make the slightest difference. They will be out. The potential good news is that Brazil will know what they have to do when they take the field for the final game of the tournament. They will know whether or not a simple win or a three-goal win is needed. Alternatively, they could be aware that they have no chance left -- and that, extraordinarily, for the third time in the last four competitions they will have failed to have qualified for the Under-20 World Cup. Brazil's Under-20 squad has had a tough campaign but can still beat old rivals Argentina for the South American title and possibly clinch aWorld Cup berth. This would not be a disaster for Brazil. Football at this level should never be all about the results. The country continues to produce many fine players -- some of whom, such as Vinicius Junior of Real Madrid or Paulinho of Bayer Leverkeusen -- are eligible for this tournament but have not been released by their clubs. These and other players would undoubtedly have strengthened the team. Moreover, failure is invariably part of success. An occasional disappointment along the way can serve as a valuable lesson. Brazil's disastrous 2013 Under-20 side produced the likes of Fred and Felipe Anderson, while Richarlison and Lucas Paqueta have not suffered unduly for their failure two years ago. But if it is not a disaster, not qualifying for the Under-20 World Cup would certainly be a missed opportunity. A generation of players would be missing out on a fascinating experience of exposure to global football. It is also bad news for Brazil's domestic game. Because the army of European scouts present in Chile for this tournament will surely be coming to a similar conclusion -- that the sooner these youngsters can be taken out of domestic Brazilian football, the better. The current Under-20 side, just like some of its recent predecessors, reproduces some of the problems of the country's club game. The centre-backs are giant figures who offer little on the ball, and need a specialist destructive midfielder to sit in front and protect them. There is a lack of fluidity in possession, an absence of interesting angles in the passing moves, a recurring desire to charge heads down in the direction of the opposing goal with little thought given to collective play. And yet this team contains the highly talented Rodrygo of Santos, who joins Real Madrid later this year, and right back Emerson who has just been picked up by Barcelona. More than a dearth of quality, it all comes across as a crisis of ideas. Brazil's 2019 Under-20 side may yet rise to the occasion against Argentina and grab South America's fourth and final place in this year's World Cup at the level. Based on what they have shown so far in the competition they hardly deserve to have the opportunity to qualify. Based on the gap between potential and performance they certainly do not deserve that chance. 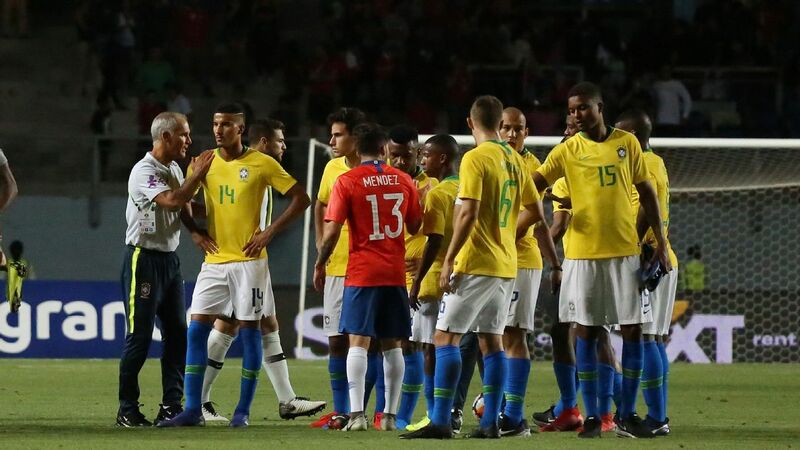 But whatever happens against Argentina on Sunday, Brazil should be giving serious thought to why their Under-20 team has been producing such sterile football.